I ended up 1-1 last week, as I hit the 2-teamer, but lost the 4-teamer because of the Raiders. They fell apart in the 2H and couldn’t hang on. That means I’m still at +1.4U profit on the season. This week there is a TNF game plus two games on Saturday. There is plenty of football leading up to the holidays and in this article I’m going to take a look at the best NFL games to tease this week. Bet on NFL teasers at BetOnline and receive a bonus for up to $1000. 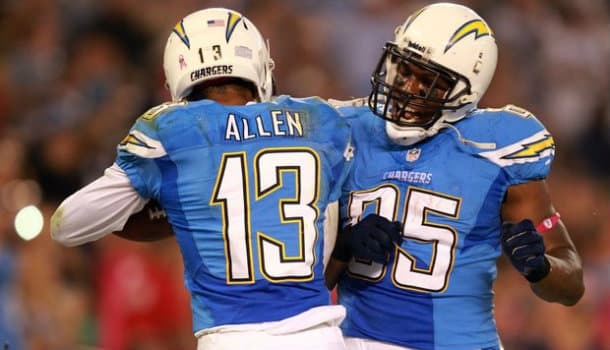 The Chargers (8-6) have lost two in a row and are now in a bad position in the AFC. They’re still alive in the playoff race, but they need to win out plus get some help in order to lock up a wild card. The 49ers (7-7) won’t be making the playoffs after being Super Bowl favorites this off-season. This is a team with a T10 defense, but the offense has been incredibly bad and that has killed this team. Matthews is out for SD, so Rivers has to step up and put points on the scoreboard. SF may not score more than 10 points. If you look at H2H trends SD is 3-0 and has owned SF throughout the years also. Atlanta (5-9) still has a chance to win the NFC South despite losing to Pittsburgh last week, but they’ll need to beat the Saints (6-8) on Sunday to stay alive. They may not win, but a +12 spread is a lot. These two teams are similar. They’re both terrible on defense, as the Saints are giving up 26.7 PPG (28th) and the Falcons allow 26.4 PPG (26th). Plus both offenses can put up points in a hurry. Both teams rank in the T10 in scoring and T5 in passing yards. This will be a high scoring game that’ll be back and forth all game. I like getting over ten points in any game, especially a division match-up. There isn’t too much to say about this one. Buffalo (8-6) had a big win last week and now they have a chance to make the playoffs. There is no way this team will blow that chance against Oakland (2-12). The Bills rank T10 in all major defensive categories including points allowed (18.1 PPG – 4th). Oakland is giving up 27.2 PPG (30th) and even the Bills will score points on them. Buffalo should dominate. I can’t wait to watch Arizona (11-3) and Seattle (10-4) on Sunday night. This is a huge NFC West game with big implications. The Cardinals are 7-0 at home, so there is no way they get blown out this week. I actually like Seattle to win SU because Wilson will manage the game perfectly and score just enough points on this stingy Arizona defense. The injuries to the Cardinals offense have been hurting them. Arizona only allows 17.4 PPG (3rd) and 90.4 RYPG (6th). If they can shutdown Lynch there is no way that they’ll lose by double digits. Expect this to be a low scoring hard fought match-up between rivals. I’m increasing my bet size this week, as next week will likely have much slimmer options. I like this card a lot and expect both to hit, which will put me right where I need to be for week 17.